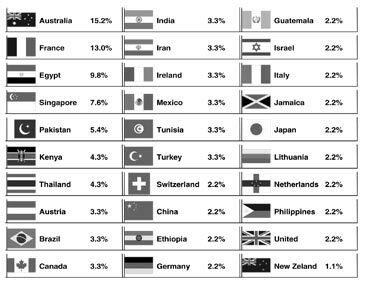 25% of the estimated 1,400 hits on Silver International's Web pages during the month of February, 2007 were from outside the U.S. Look at the chart countries readers were from. Once I saw a student with an issue of Silver Chips that had an issue of Silver International inside. When he saw Silver International, he looked at it and said to his friend, “Who reads Silver International, anyway?” “Maybe ESOL students?” his friend answered. Actually Silver International is a newspaper created by and for students who are learning a new language, not necessarily ESOL students only, and it is read by many people around the world including many non-ESOL people. There are also many people who read Silver International because it helps them learn customs, cultures, and problems of people around the world. Yes, it’s true, there are many people in school who don’t know what Silver International is and that is the reason why they don’t read it. Daniel Diaz a freshman does not read the newspaper “I feel it is boring and there is nothing new,” Daniel said. But not everyone is like Daniel. A lot of people in our school read the newspaper for different reasons. Many of them like the newspaper and find it interesting. Ms. Hack, one of our school library specialists thinks it is a good way to know more about the people that are in the school that the librarians have seen briefly. They can know the students better from their stories in Silver International. Ms. Catza scans to see who she knows first and then sees what they wrote “It’s a good opportunity [for ESOL students], because they don’t have other places to put it [their writing].” Ms. Catza said. ESOL students also read Silver International. Masha Zoz a student from Russia likes the newspaper and she reads it. “I read it because some of my friends write for the newspaper.” Rishou Han a 10th grader from China reads the newspaper to learn more about people. Vinh Phung from Vietnam likes the February issue of Silver International. “I want to know if people sent a Valentine messages to me,” Vinh said. Sally Lanar an alumna of Blair and a former Silver Chips staff member used to read the Silver International and also helped the staff of Silver International. “I read Silver International because I think that it shows a side of Blair that you don’t get to see when you read Silver Chips.” Sally said although Silver Chips tries its best to write stories about the whole Blair community, she thinks that because most of the staff are in the Magnet or CAP (Communications Arts Program), they might not have the experience the ESOL students had have. Besides Blair students, other students in other schools are getting the newspaper. Students from Takoma Park Middle School also read Silver Interntional. “Information [in] the stories how we came to the U.S are good.” Bianca Hernandez said. “The newspaper is a really good example for me. I enjoy reading your articles.” Rute Kiros said. Not only students from other schools also from other countries. Students from the Gymnasium Wandlitz in Germany also read Silver International. “We read the newspaper because we can learn something about the English language” Susanna Müller and Joyce Wolff said. “We read Silver International very gladly. It’s great that articles are made from kids and teenagers,” Kina Komm and Luisa Kolbel said. Many students may not know that Silver International is also on the Internet at http://silverinternational.mbhs.edu. A special counter on the Web page counts where readers of the page are from and some of the articles that they read. In the month of February only, more than 1,400 people viewed Web pages of Silver International. Look at the chart above to see where the February readers were from.